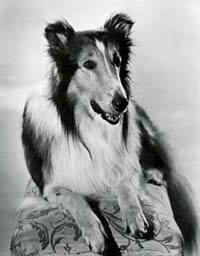 Lassie was one of the most beloved dogs in all of Hollywood. From rescuing Timmy from a well to untying kidnapped victims, Lassie does it all. Based on the original novel by Eric Knight, Lassie is the adventurous collie which began as a short story in the Saturday Evening Post. The story of Lassie was expanded into a novel and then Lassie Comes Home was filmed in 1943. The radio show was produced between 1947-1950, years before the award winning television show. Sponsored by Red Heart dog food and treat companies, the radio series stars Lassie under various dog names including "Jumpy" and "Tramp." Brave, injured and starving "Laddy" fights off a bear for food then after long travels, returns safely to his mistress' home. For more adventurous animals, see also: Adventures of Champion (Gene Autry's Horse), Lassie, Rin Tin Tin, The Challenge of the Yukon, and the Original OTRCAT Dog Collection. My dog, Harry, doesn't care too much for OTR. I offered to get him some Lassie CDs but he says he doesn't like long haired broads. I loved Rin Tin Tin radio program and Lassies radio program too. I often wondered in both if they had the actual dogs in the studio to do the barking or sound effects man. They had both. 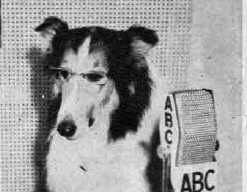 Lassie was next to a microphone to bark on cue, but in case she missed it, a sound effects guy was standing by to bark. I think Lassie had the real dog there. I've got episode where he jumped a cue during the commercial and the kiddie audience laughed.